I finished working on this tattoo about a month ago and just took some healed pictures. I did everything but Joker, unfortunately, which was done before by someone else, then fixed by another guy (that's how it looked before I started working on it ), so I was to turn that tattoo into a sleeve. I put a king’s head on the inner arm since it seemed obvious having Joker in such a pose, holding a kings crown. I also added some drops of blood to the Joker’s knife to make it work with the King’s head and blood coming from his neck. 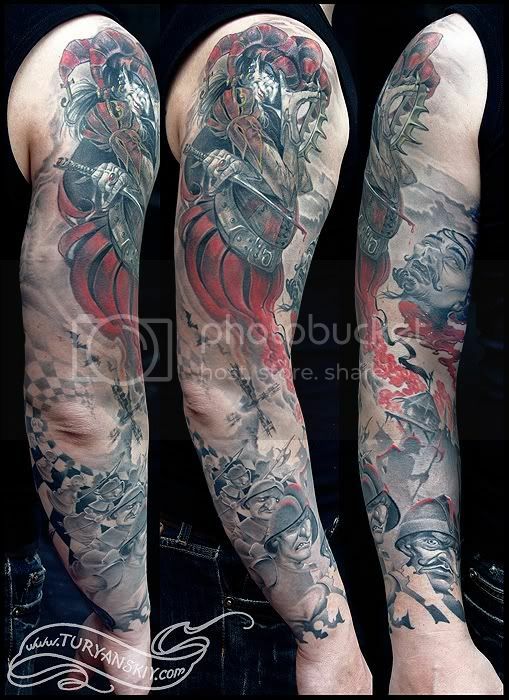 Lower part of this Joker and Chess King tattoo sleeve shows the transformation of the chess figures into knights. Existed Joker tattoo was fixed by me once more. I had a lot of fun working on this Joker and Chess King tattoo sleeve, I enjoyed doing this custom tattoo, having a freedom to show my vision. As you probably noticed all of my art works devoted to fantasy creatures and it was a great pleasure to tattoo these characters as well. I wish I had more inquiries of that sort. It took me about 40 hours / 7 sessions to complete this Joker and Chess King tattoo sleeve. A few detailed pictures of this custom Joker and Chess King tattoo sleeve available in my Tattoo Gallery.